Most U.S. cities pursuing streetcars are doing so primarily for their purported development effects, as opposed to for their transportation role, yet there is little evidence about the nature or magnitude of these development effects due to a scarcity of rigorous, empirical research. Most available work simply presents descriptive information about development outcomes (typically measured as changes in population, employment, land values, or permit activity) within streetcar corridors as indicators of the streetcar’s development effects. Alternate factors which may have influenced such results are often not considered, placing into question the validity of such measures. 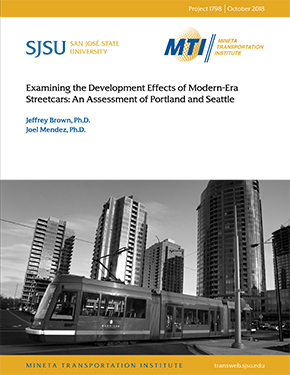 This study examines the development effects of streetcar investments in two U.S. cities that implemented streetcar service between 2000 and 2010: Portland, Oregon, and Seattle, Washington. The authors explore the development outcomes (here measured as the number of permits issued) through a combination of statistical analysis of development activity in the streetcar corridor and interviews with key streetcar stakeholders. The statistical results indicate that areas around Portland’s initial streetcar line experienced higher levels of development activity (more permits issued) than areas not served by the streetcar, although the differences in activity between served and not served areas since the opening of the second line have been insignificant. In Seattle, the areas around the streetcar line in the South Lake Union neighborhood experienced greater commercial development activity (commercial permits issued) but less residential activity than nearby unserved areas. The interviews provide important local context for the interpretation of the empirical results and highlight the continued importance of development as a rationale for streetcar investments, as well as to the limitations of the streetcar as a transportation service. Jeffrey Brown is a Professor and Chairperson in the Department of Urban and Regional Planning at Florida State University. His research explores the role of public transportation in contemporary cities; transportation finance; the interplay between the finance, planning, and use of transportation systems; the relationship between transportation and the built environment; and the history of planning. His most recent work includes an examination of streetcar systems in U.S. cities and an assessment of strategies for transit to better serve aging populations, particularly those residing in rural areas and small communities. Joel Mendez is an Assistant Professor in the School of Public Affairs and Administration at The University of Kansas. His research interests lie in the intersection between transportation, economic development, and social justice. His most recent work includes the examination of development outcomes within new transit service areas via an equity perspective.